With hundreds of styles of outdoor patio furniture, the right choice can bring you outside more often. Most people want something that’s worry free, durable, beautiful and comfortable. Here are a few things to keep in mind when shopping for outdoor furniture. Do you have off-season storage space for your outdoor furniture, or do you want to simply set it up and forget it? Do you dread spring and fall cleanup and the thought of buying special cleaners, strippers, stains, sealers, paint or rust-proofing products? 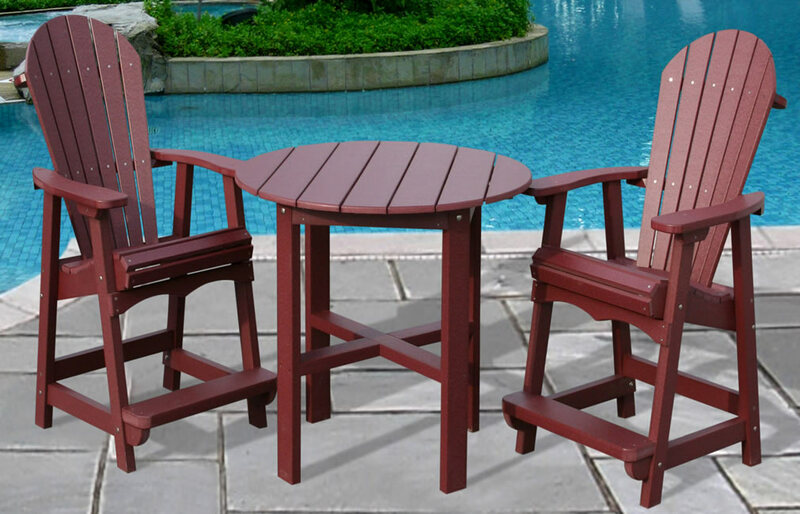 Do you prefer eco-friendly outdoor furniture such as chairs and tables made from recycled materials? And remember, the right style for your landscape, patio, deck and other outdoor spaces can make the difference between creating a plain and ordinary outdoor living space or an enticing one. Patio Town’s exclusive Comfort Craft® outdoor furniture is superior for many reasons and for all seasons. Put it out and enjoy it for a lifetime. It’s that simple. 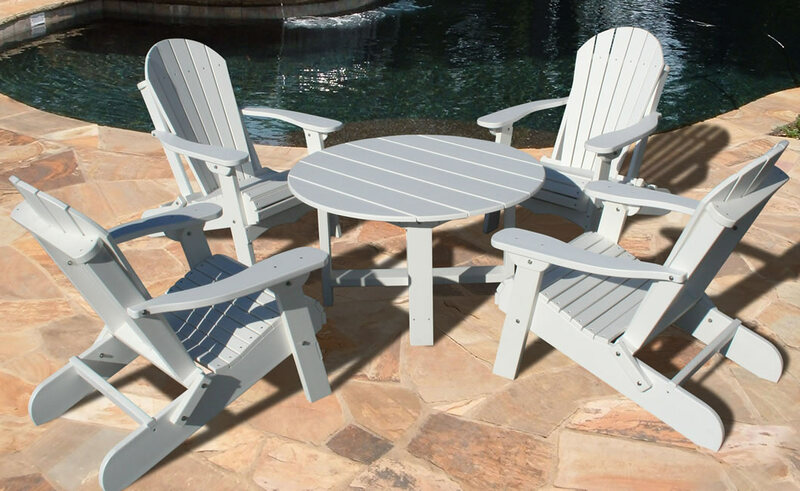 With durable, casual and eco-friendly Comfort Craft outdoor furniture, you can add style and unmatched comfort to your patio, deck, porch, yard, three-season room, courtyard, firepit, outdoor fireplace and garden areas. Designed with your body in mind, the contours of the chairs and seating choices will put your back at ease. A variety of styles and options — both fun and functional — are available for anywhere around your home and yard. Selections range from traditional seat height up to deck, balcony and pub-style seating. Made in the USA, the Comfort Craft line includes rich earth tones like cedar, Weatherwood and two-tone browns plus vibrant teal, orange, yellow, red, lime and blue. Black, white, brown, burgundy and green are also available. Create custom two-tone color combinations to add pizzazz or to complement existing furnishings, landscapes or hardscapes. You can design multiple matching or complementary arrangements for lounge seating, firepit surrounds, fireplace areas and other outdoor living spaces. Choices include folding chairs, pub chairs, deck chairs, rockers, gliding chairs, swings, settees, dining sets and end tables. With a taller profile, balcony-style selections are perfect for apartment verandas, terraces and decks, and pub styles are great for an outdoor bar, lounge and dining area. 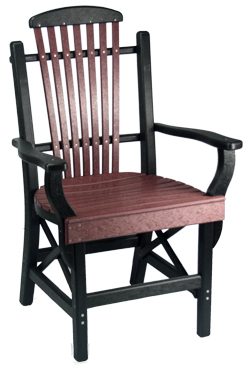 Three styles give you plenty of options: Adirondack, with vertical slats fanning out to form the backrest that surrounds you as you sit; Rollback, a wider design with horizontal slats and comfortable curves; and Bent Arm, a traditional garden design that is comfortable, classy and distinctive. Visit our Outdoor Furniture page to browse all the options or read more below for styles/options. With Comfort Craft, there’s no more worry about prepping the outdoor furniture for the seasons — or even storage. Comfort Craft requires no sealing, painting or staining and uses stainless steel fasteners that don’t rust or corrode. Clean up is a snap with plain soap and water. Unlike wood, there’s no chipping, cracking, rotting or splintering. The material has no fillers such as wood fiber that cause moisture absorption. UV inhibitors prevent fading. Care and maintenance of Comfort Craft furniture is super easy. It’s a great choice for anyone who doesn’t want heavy lifting, hard cleaning, or the packing and storing required of other types of outdoor furniture. You can see and feel the difference and durability of eco-friendly Comfort Craft. 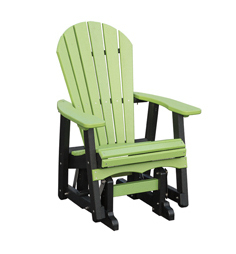 Crafted of 100 percent recycled High Density Polyethylene (HDPE), Comfort Craft has the look and feel of real wood. Many competing products are made of Polystyrene, a lighter and less stable plastic that is also used in foam food containers. An environmentally friendly alternative to traditional outdoor furniture, Comfort Craft will look good for decades. Recycled HDPE makes good reuse of discarded consumer and industrial plastic products. Folding chairs are great for easy, compact storage or transport, provide comfortable lumbar support and are available in 30” and 32” widths with a 15” seat height. Deck chairs, with a 17” seat height, sit taller than folding chairs and are popular in sets of two or four around a conversation table. A settee unit can be used to join two deck chairs and provide a handy central surface for food and drink. Balcony chairs, with a 24” seat height, are great for views over balconies, railings or obstructions. Popular in groups of four with café or pub tables, a balcony set offers a comfortable, formal setting for meals and more. Chairs have attached footrests for maximum comfort, and a settee table can join two chairs. Pub chairs, at a 29” seat height, are perfect for entertaining and informal dining when paired with a pub table. An attached footrest offers maximum comfort. Gliding chairs, at 29” wide, offer a gentle back-and-forth motion as opposed to the traditional swing of a rocker. Swings, at 52” wide, are stylish, cozy and comfortable. An Adirondack swing makes a great addition to a traditional porch, pergola or anywhere you hang it. Double gliders, at 52” wide, are popular for areas where a porch swing is not possible or desired and offer the same gentle motion as the gliding chairs. Rollback – A wider seat (23”), horizontal slats and a rolled back and seat edge allows for maximum comfort. Rocking chairs are comfortable and sturdy classics with deep seating and a curved back — perfect for porch, deck or anywhere in your yard. 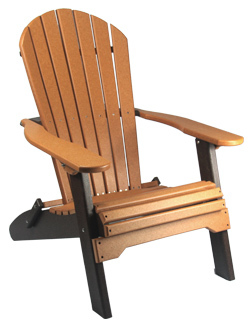 Gliders offer the same advantage as Adirondack style but are available in 4’ or 5’ gliders. Swings are classic favorites and come in 4’ or 5’ sizes with a curved, draping back design for ultimate comfort. Bent Arm – This garden style design offers a distinctive, formal look with ultimate style and comfort. Chairs are comfortable and classic and pair well with a side table or a 48” round Bent Leg table as a dining set. 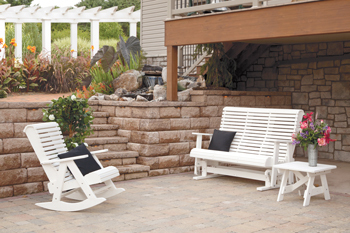 Rockers are reminiscent of the “bent willow” design but are less rustic and more comfortable. Settees for all styles can be created with two standard, deck or balcony chairs and a settee table, providing comfortable seating for two and an easy-to-reach surface for food and drink. Ottomans can be paired with most chair styles in Adirondack, Rollback and Bent Arm. Side tables, great for morning coffee, afternoon tea or evening wine, include square end tables (23” x 21” x 18” high) and round styles (28” diameter x 21” high). Café tables, at 28” diameter x 29.5” high, are the perfect height to pair with balcony chairs or as a taller side table option. Round dining tables are available in different diameters and heights and complement all styles. Dining tables are available in 50” diameter and 29” height with traditional four leg design. Patio tables are 48” diameter x 29” high and work well with traditional height chairs. Pub tables, at 44” diameter, have a different leg style that allows for pub chairs to be tucked in when unused. Balcony dining tables, designed for balcony chairs, are 44” diameter and have same leg style as patio tables. Bent Leg tables come in two options that are 48” in diameter with an attractive skirt circling the table edge and a classic leg, are designed for the Bent Arm chairs.